BEWO 350LT, 14’’ COLD SAW. HAEGER HP6-B, 6 TON HYDRAULIC INSERTION PRESS WITH BOWL FEED, S/N 1519. CLARK GC30MA, 6000 LB LPG FORKLIFT WITH IDE SHIFT, 3 STAGE. 1995 AMADA M-3060, 10FT X .25’’ MECHANICAL POWER SHEAR WITH CNC BACK GAGE,S/N 30600919. WILTON 3120 VERTICAL BAND SAW. 1995 AMADA PEGA 357 CNC TURRET PUNCH, 33 TON CAP, FANUC O4PC CONTROL, THICK TURRET, AUTO INDEX, 58 STATION TURRET, S/N AA570565. AMADA DIE GRINDER MILLER SPOT WELDER. JANDA 250 KVA SPOT WELDER, TYPE R3-30- 250, W/ UNITROL SOLUTION CONTROL, S/N R1890. TIMESAVER 137, 37’’ WIDE BELT GRAINDER WITH DUST COLLECTOR, S/N 23819M. 1994 AMADA CSHW-250, .25’’ HYDRAULIC CORNER NOTCHER, S/N 22002070. ARBORGA GEAR HEAD DRILL PRESS, S/N A-3008. SUPERMAX LE-1338, 13’’ X 38’’ ENGINE LATHE WITH DRO. MILLER SYNCROWAVE 351 TIG WELDER..
MILLER MILLERMATIC-250, 250 AMP MIG WELDER. SUPERMAX VERTICAL MILLING MACHINE WITH VAR SPEED, DRO, AND P.F. X-Y. 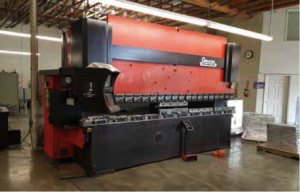 1993 AMADA HFBO-170- 40, 10FT X 187 TON CNC MULTI AXIS PRESS BRAKE,WITH OPERATEUR AMADA CONTROL, S/N A170-40- H31004. ULTRA MATIC SVB-3.5, VIRBRATORY TUMBLER. AUTO SERT AS-7.5 HYDRAULIC INSERTION PRESS WITH BOWL FEED, S/N 00337. IR SSR ROTARY AIR COMPRESSOR. LARGE SELECTION OF PRESS BRAKE TOOLING, AMADA PUNCHES AND DIES. LARGE SELECTION OF MATERIAL RACKS. INSPECTION TOOLING, GRANITE TABLES, TOOLS AND SUPPORT.